Gov. Gretchen Whitmer, a Democrat, has proposed undoing a 2011 tax change that taxes some retirement income. The proposal has support from lawmakers from both parties, though some Republican legislative leaders say they are hesitant to simply repeal the policy without considering the fairness of how retirement income is taxed. Is it fair to tax some Michiganders’ retirement income and not others? Democratic Gov. Gretchen Whitmer and GOP lawmakers who control the budget process will have to contend with that question this spring as they negotiate whether Whitmer’s campaign promise to undo her Republican predecessor’s tax on some retirement income will be built into the state’s next budget. Support for doing away with former Gov. Rick Snyder’s so-called “pension tax” is gaining steam among some legislators from both parties, who say repeal would do right by seniors who were asked to shoulder more of the state’s income tax burden in 2011 to help pay for a more than $1 billion tax cut for businesses. But defenders of the tax, who include some Republican legislators and business groups, also cite fairness as a primary concern — namely, that all forms of retirement income should be taxed similarly. The 2011 tax change ended a 100-percent income tax break for government pensions and lowered deductions for private retirement income, including pensions and individual retirement savings, bringing more parity to public and private retirement benefits. Those contrasting views have House and Senate lawmakers working on a legislative compromise, said Gideon D’Assandro, spokesman for House Speaker Lee Chatfield, R-Levering. Budget negotiations will be further complicated by Whitmer’s desire to offset the more than $300 million in state general fund revenue that would be lost if she does away with the pension tax by increasing the income tax rate paid by some businesses — a proposal the administration calls “tax parity,” but that has angered business groups. Senate Majority Leader Mike Shirkey, R-Clarklake, voted for the 2011 tax changes while serving in the state House and said through a spokeswoman he continues to support them. Chatfield wants to give seniors tax relief, but is open to discussing what form that would take as part of a compromise, D’Assandro said. A powerful voice for retirees is also watching closely. The 2011 tax changes were phased in based on a retiree’s birth year. The oldest retirees, those born before 1946, are unaffected. Those born between 1946 and 1952 can deduct the first $20,000 of retirement income for single taxpayers and $40,000 for married couples filing jointly prior to age 67; when they turn 67, they can claim those exemptions against all income, regardless of the source. The youngest retirees, born after 1952, don’t get to deduct any retirement income until they turn 67 — which will happen starting next year — when they also can claim more limited $20,000 and $40,000 income tax exemptions. Whitmer’s administration said her proposal, beginning in the 2020 tax year, would again exempt public pensions and restore deductions for private retirement income, including private-sector pensions, withdrawals from individual retirement accounts (IRAs), and the portion of a 401k account that is subject to an employer match. For the 2019 tax year, those private-sector thresholds are $52,808 for single taxpayers and $105,615 for married couples filing jointly, according to the Michigan Department of Treasury. The administration’s proposal also would allow Michiganders born after 1945, once they turn 67, to choose between deducting their retirement income or claiming income tax exemptions of up to $20,000 and $40,000 for filing solo or jointly, respectively, on all sources of income. The administration projects Whitmer’s repeal proposal would save close to 425,000 households $800 on average each year, and 600,000 households would pay no state income tax on their retirement income. It would cost the state an estimated $259 million in the 2020 fiscal year, which starts Oct. 1, and $355 million in 2021, according to Treasury. While the administration’s proposal would entirely exempt public pensions and not private retirement income, said Jeff Guilfoyle, the state’s chief deputy treasurer, deductions for private-sector retirement income would be generous enough that the majority of retirees wouldn’t pay state income tax on the amount they receive each year. State Treasurer Rachael Eubanks said one factor to consider in the debate over fairness is that government employees often earn less pay than they could make in the private sector, anticipating that they will receive more-generous retirement benefits. Whitmer’s proposal comes after Republicans in the House and Senate introduced legislation this term to reverse the tiered retirement tax changes from 2011. A House committee recently voted to send a bill introduced by state Rep. Joseph Bellino, R-Monroe, to a second committee for consideration before it heads to the House floor. The nonpartisan House Fiscal Agency estimated Bellino’s bill will lower state personal income tax revenue by $330 million, increasing by roughly $15 million each year as more people retire. The state changed the game on seniors in 2011, Bellino testified in a hearing in late February, shorting younger retirees who have to pay taxes on their fixed retirement income while also budgeting to afford necessities such as car insurance and heat. Bellino’s bill differs from Whitmer’s proposal in part because it would not continue the $20,000 and $40,000 tax deductions on all income for seniors 67 and older. The state Treasury said Bellino’s bill would increase taxes by an average of $650 on an estimated 38,000 households as a result of ending those deductions. Fewer private-sector companies are offering defined-benefit retirement plans, what are traditionally considered employer-promised pensions. More are opting instead for defined-contribution, 401k-style savings accounts, to which employees contribute money and employers can match. The public sector has been slower to make that change, said Lupher, of the Citizens Research Council. Many local governments struggle to set aside enough money to cover their full pension obligation, which they’re constitutionally required to pay out to retirees. And Michiganders are getting older. In May 2008, the Citizens Research Council issued a report on the state’s fiscal future that noted that tax-exempt retirement income will limit state income tax growth as more residents retire. Business groups that support keeping the tax in place, including the Detroit Regional Chamber and the Michigan Chamber of Commerce, say the decision eight years ago to tax more retirement income addressed the fairness issue. House Democratic Leader Christine Greig, of Farmington Hills, disagrees, saying that Snyder’s approach asked residents to pay more so business could pay less. D’Assandro, Chatfield’s spokesman, said one possible alternative could be to lower income tax rates on both public and private retirement income, rather than exempting it from taxes. Another could be to link the amount of income tax paid to a retiree’s ability to pay — if it can be done without violating Michigan’s constitutional prohibitions against a graduated income tax, said Robert Kleine, a partner with Great Lakes Economic Consulting and a former state treasurer in Democratic Gov. Jennifer Granholm’s administration. 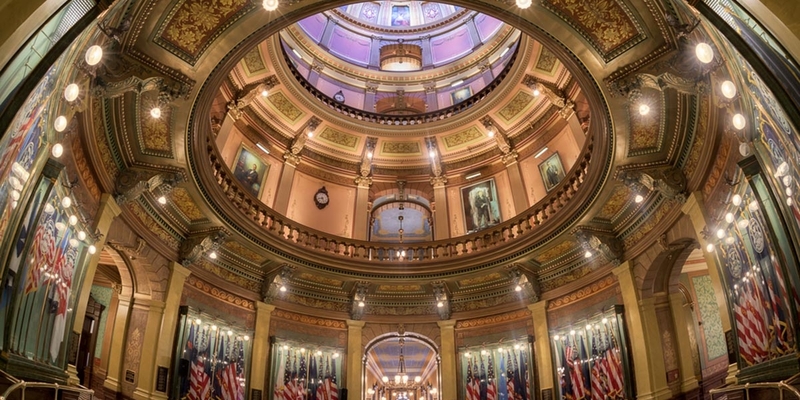 The original version of the law passed in 2011 attempted to do that, but the Michigan Supreme Court, in an advisory opinion issued at Snyder’s request, said that approach was akin to a graduated income tax and could not be enforced. “It might be unconstitutional, but I think that would probably be fairer,” Kleine said, adding that there may be other ways to offset the burden for low-income seniors. I worked for 31 years under the assumption my pension was going to be non-taxed by the state of MI. During the year I retired that rug was pulled out from under my feet. I feel as if the state has stolen that 3% to be gifted to the corporate entities that received the tax break. I worked as a science teacher......earning notably less than my colleagues in the private sector my entire career. Do you wonder why the state is having teacher shortages? Yup. I feel ripped off. And were did that money go???? Well they need to also do away wiht the tax on us veterans that get disability pay from the VA! Property tax rebate If i claim that i am a disable veteran I get kack $300.00 less!!! I'm the one that feels ripped off. John, you were paid with tax dollars your entire career. In retirement you don't use the roads or any other infrastructure? The politicians sold you a pie in the sky bill of goods telling you your pension would never be taxed. You should chip in just like the rest of us for the infrastructure you use, including schools. The "corporate entities that received the tax break(s)" ? You don't get it. Previous to 2011 C-corporations were largely skating on tax because of loopholes. Now they must pay the 6% Corporate Income Tax (CIT). Before 2011 S-corporations (like mine) had to pay income tax at the corporate level then pay income tax on the same money AGAIN individually since S-corps are pass through entities. You think it's fair I pay twice so you can get a public employee pension tax break? Pay your fair share like the rest of us peons. Maybe you've got (a bit of) a point! Perhaps all pensions should be free of Michigan income tax--whether public or private. And, yes, we drive on the roads--and our gasoline tax pays for them. Our property taxes also pay for many of the services that we use. The reason why public servants were traditionally paid less than people with similar education in the private sector was that robust benefits are vital to the smooth functioning government. Attractive pension, adequate pay, long-term employment guarantees, and other benefits are important to both retaining public servants that are committed to public service and ensuring that they won't give in to the temptations of corruption in order to pad their income. These things are essential to the kind of good government that benefits everyone. "Ripped off" seems like strong words for a system that allowed you to retire after just 31 years of working. Most of us middle management or less work more like 40 to 45 years. We get no pension. We save we invest, we pay our income taxes. Our income from our retirement investments will continue to be taxed. I am OK with that. But I really find it offensive when part of my taxes go to someone who will get a lifetime pension, which may last longer than the years he works feels "ripped off" when asked to pay the same single digin income tax that we all pay. Please stop calling it a "retirement tax". Let try to use the accurate words for things in the news business. It is an INCOME TAX; and ALL Michiganders should pay it. Take 3 guys each making $40K. One works all week 52 weeks per year. He pays income tax. One retired after she worked 45 years in business. Has no pension but lives off savings and investments. She pays Income tax. One worked 30 years in public service; gets pension for life (maybe 30+ more years), and does NOT pay income tax; and if you ask him to; it gets re-labeled "retirement tax". Please lets not introduce fake terms with an agenda. Absolutely! A total propaganda term by a crap governor and politicians! Pensioner no tax, retired guy working a part time job, taxed and with FICA to boot! Often, where you stand depends on where you sit. In 1997 I sat in a State of Michigan office. Gov. Engler asked that some of us leave, and so I did. Part of my deal was a pension free of state income tax. When Gov. Snyder and the legislative Republicans reneged on that deal they became common business cheats. All you can do once cheated is avoid the cheaters in the future, and so I have, in every election since, and will until my deal is restored. You base all of your votes on one incident? I bet that one incident has cost him a lot of money. Move to FL, TX , WA .... ? No income taxes in those states. If you are a snowbird, you can move your residence to a state income tax free state. But even more onerous than the state income tax on retirement income is the way the homestead exemption affects Michigan income tax. Give up your homestead exemption and immediately add 18 mils to your Michigan property tax. For most, this is a 50 to 60 percent increase in your property taxes. It is a balancing act to be performed each year at tax time. Prior to 2011 my 19 year old daughter paid more state income tax on less income then my baby boomer retiree friend who had more retirement income then her. We're not only talking about fairness between retirees but fairness to young working class people who's economic future has more headwinds then most of today's retirees ever experienced at a similar age. The crime in 2011 is that we handed well to do business owners (like myself) a significant and unwarranted tax gift instead of investing in our infrastructure and education. Now we find ourselves with kick the can/unfunded road legislation and near the bottom rated education outcomes. Lets quit with the "tax cut illusions" and get serious about investing in our states future! The debate on the fairness of taxing pensions is missing a huge piece of history. When I started teaching in Michigan in the early 1970's, paying into the school employees pension system was mandatory. The value of your pension would be 1.5% times the average of your best five years annual pay, times the number of years served. At the time private sector pensions used a multiplier of 2.0% or 2.5%. The rational was that the state would pay out less in pension payments and just not tax them so as to keep the school pensions somewhat competitive with the private sector. To suddenly begin taxing these public sector pensions in 2011 is to break a promise. The notion of taxing all pensions out of "fairness" is to renege on a fair agreement that is many decades long. The absence of the historic pension plan is a major cause of the inability of school districts to compete with the private sector in hiring and retaining dedicated employees. Why I remember in 1912 when we didn't have a permanent Federal Income Tax. Come on. Things change, circumstances change and politicians at all levels of government from the smallest village up have been kicking the can down the road for many decades. As a small business owner and the spouse of a State of Michigan retiree I would like to point out that businesses do not pay taxes. They collect it from their customers and then forward it to the state. Prices will go up. No business will be able to absorb the extra expense . Should public policy be based on isolated cases of whining and hardship or should it be based on some overarching principles of fairness and treating citizens the same? Should we treat people the same regardless of who they worked for or have all sorts of carve outs for every conceivable characteristic? The state tax rules developed to transition Michigan away from this special treatment seems as fair as anyone should expect. A second observation. Our Gov thinks that subjecting some few pensioners to 4.25% income tax on a small portion of their income has some especially negative effects that we should jack around with the tax code to shield them, by raising my effective income tax from 4.25% to 6% will have no negative effects at all? Either people will react and take actions to avoid paying taxes (moving out of state?). Or they won't which is it? I agree with you, Matt. As soon as I can I'll be moving to south Texas. Michigan is quite regressive. Don't let the door hit you on the way to the promised land of Texas Jerry. Looks like good fishing down there? I'd like to check it out. I retired before the retirement tax changes were made by the MI legislature. Retirement is a big adjustment to one's life. I debated many years and calculated a financial budget in order to retire. It is not fair to create a tax after a person retires because they are a fixed income. I have to cut many items from my budget. I am not able to return to work. This tax was unfair and unjust and I demand you make me and other retirees whole. Thank you. These business owners complaining about fairness fail to mention one thing. Private Citizens who planned their retirements and then had a portion of their funds taken away can't claim some of the deductions that these business owners do. I can't deduct anything for my vehicle-maybe I should slap a decal on the side so I too, can drive it up North for my weekends like so many others do. Seniors don't have that luxury, or several others that business owners enjoy. Deductions aren't nearly as fruitful for Seniors living on a fixed income. Can we agree - no one likes taxes; income, sales, gas, whatever. But since we must be taxed, we'd like to think it's done fairly, with all sharing the burden. Ok, so that might be expecting too much. But we all use the roads, expect state roads to be plowed, the grass to be cut, businesses to be inspected, taxes collected, etc. So why do some think they shouldn't share in the cost? I'll be retiring in less than three years. Should I expect my kids, grand kids, your kids, etc to pick up my tab when I retire? The state needs young people who are working to continue to fill the state's tax coffers. How can we expect to keep our kids here or attract others when they have to carry our burden as well? I'm no fan of taxation, but I'm even less a fan of having others carry the tax load for my sake. Private Pensions should be treated equally the same as Public Pensions. The preferential treatment for Public pensions is wrong. The People are PAYING for the Public Pensions!